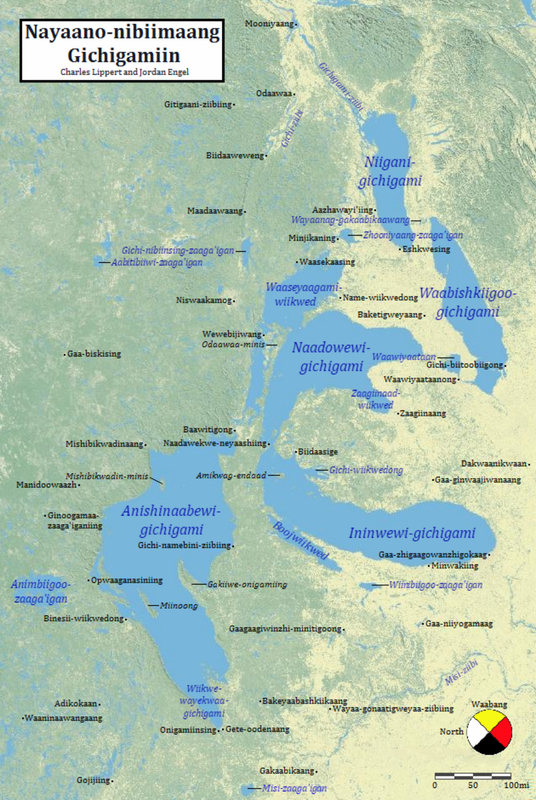 Nayaano-nibiimaang Gichigamiin means “The Five Freshwater Seas” in Anishinaabemowin. The cultural impact of the Anishinaabe on the region is everywhere, as evidenced by this map. The toponyms that appear on this map are listed below. They include the Anishinaabemowin name, translation, and the English name. Previous What If Maps Were Made By Africans For Their Own Use? please put these on wikipedia to allow for people who are familiar with the tribes to contribute valuable information about them. Hi. I’ve been trying to find out what the Ojibwe name for Ile Parisienne, in Whitefish Bay, is. Does anyone know? This is great, but what about the Cuyahoga and Ohio rivers? Hmm, the homelands of another people(s), and geography beyond our knowledge. wawayah kakehpapikong would also refer to as Niagara Falls. The first part wawayah means something that is curved or semi-circular. The last part refers to something being on the way or a natural obstruction like kehbosin. I’m a fluent Ojibway speaker and my first spoken language and aware of dialectal variances as I have travelled both in Canada and the Great Lakes States. Your right on about Montreal being called Moonihyong. It’s translation means place of the whiteman. Montreal was an early settler society in Canada and therefore the name. Mooniah is another name saying a white person in some areas of the Ojibway country as much as Gitchi mokamon in the US. Wonder what the original people called that part of the land (Montreal) prior to European settlement? It was also a way to refer to “the town of money” – referring to silveror shiny coins. That’s where financial transactions were done with europeans. (primarily French). Bemidji to full word of Bemidgjiwan = clam flowing waters. Oshawa – O-zha-way – Favorably known Crossing place. Georgian Bay = Gitche Namay Weeqadoong- Bay of the Great Sturgeon. Bobcageon = Baapkijiwan – water flowing through precipitous rocks. I have been following your site as I’ve been doing something kind of similar, adding some indigenous toponyms into OpenStreetMap as one way to acknowledge first nations. In particular I’ve added a number of Ojibwe and Dakota names in the Minnesota. (For example, you can see labels for the lake and city of Bemidji in this rendering: http://mlm.jochentopf.com/?zoom=14&lat=47.49099&lon=-94.85029&layers=B0T&lang=oj) I’ve mostly sourced from Wikipedia since I’m concerned about potential copyright issues if I use book sources and don’t know of other sources. But not being a speaker, I’ve wondered about the things Charles mentioned such as spelling (I’ve seen variations) and/or regional differences. I’ve also wondered about how appropriate it is to use an indigenous name for a modern city. For example, is it really true that Gakaabikaang=Minneapolis? Or do they overlap such that Gakaabikaang really just refers to the part of Minneapolis which is the immediate area around St Anthony Falls? I’d be interested in any thoughts! Ah, someone else adding Ojibwe place names to OSM — good stuff! Just as a note. The Anishinaabemowin on this map is shown written in “Southern” Fiero-Nichols orthography, with more western “Ojibwe” bias. For more eastern forms of Anishinaabemowin (such as for Eastern Ojibwe, Mississauga, and Odaawaa), one must apply vowel syncope in a Fiero-Rhodes orthography. Or for Algonquin, Cuoq Orthography. Or for Saulteaux, Cree-Saulteaux Standard Roman Orthography (SRO). Or for Oji-cree, “Northern” Fiero-Nichols orthography. For Northern Potawatomi, WNALP orthography (with syncope). And for Southern Potawatomi, BWAKA Orthography. Why? Because Anishinaabemowin is a diverse set of languages with diverse set of writing styles. An idea for future map series could be to present the identical map in each of these different orthographies, to better reflect the diversity of Anishinaabemowin. When’s that one coming out? !